I stayed tight to my brother Lucas as we aggressively closed the gap on the rutting mule deer buck. The Heads Up Decoy (HUD) mule deer doe was working perfectly to mask our approach as we neared the buck. Finally he turned on a dime and was coming right at us! Was this really about to happen? We had already decoyed one mature buck that ran off with an arrow in his vitals. Were we really going to be blessed with a second mature buck coming into bow range in less than 30 minutes? Growing up, I was obsessed with hunting from a young age. My younger brother, Lucas, could take it or leave it. Most of the time he would just go because he was tired of me nagging at him and it was a good excuse to go spend time together. I started bowhunting during my college years and was immediately hooked. When Lucas decided he wanted to buy a bow and try bowhunting I was super excited. It didn’t take long until he became addicted like the rest of us and now he spends many hours in the field each year with his bow in hand. Being the older brother, I always want to see Lucas have success. My desire for him to get quality opportunities on hunts and fill tags has created pressure on myself as well as on Lucas when it comes to making the shot. This has burned us on past hunts. We have matured as hunters and strive to just relax and have a good time, which has improved our success, and most importantly the enjoyment of hunting together. 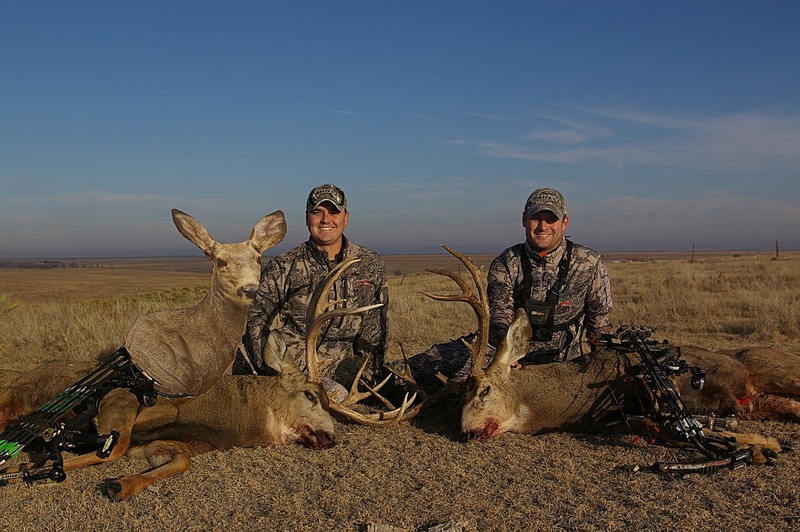 I moved to western Kansas in 2005 and we have talked about getting together to hunt mule deer every year since, but family responsibilities and eastern Kansas whitetails kept Lucas from venturing out west during the rut. We decided during the summer that it was time to quit talking and start doing, so we made plans for Lucas to come stay a few days during November and try to kill his first mule deer. We locked in a four day stretch around Veteran’s day to spend hunting together. The week was finally here, and the excitement was too much to manage. Lucas was able to duck out of work early on Thursday allowing him to arrive in time to have a couple hours to scout some areas for the next morning. Lucas arrived around 3:30 in the afternoon and it didn’t take long for us to get dressed in our Sitka gear and head out to try to locate some deer. Neither of us expected much, but we were excited to spend time together and see some animals. Shortly after leaving town we saw a lone buck cruising through a crop field. We glassed him and thought he was too small to shoot so early in the hunt, but as we watched him he continued moving in our direction, further tempting us. We contemplated trying to kill him, but ultimately decided he just wasn’t what we were looking for. We continued down the road to an area where I saw a nice typical earlier in the season. I had also watched some does using the field so I thought it might be a good place to check with the rut activity picking up. It didn’t take long to spot a decent buck cruising through the drought stricken corn in search of a receptive doe. The corn was very thin and non-existent in some spots, but would provide enough cover for us to try to close the distance on the lone buck. We made it several hundred yards into the corn before spotting a deer in the middle of the field. It wasn’t the mulie we were going after, but it was a mature whitetail buck. After looking at him closer we decided he would be hard to pass on if he came over to check us out. We had the HUD mule deer doe decoy and I was wishing I would have brought my whitetail buck HUD along as well. We still thought the buck might check out the mule deer decoy so we hunkered down on the back side of a terrace in some weeds and continued showing the decoy to the whitetail. He would look at us and then look away. It wasn’t long until the mulie we were stalking came into view and the whitetail bristled up, posturing towards the mule deer. The mulie continued on and we lost sight of him. However, the whitetail was still watching us from several hundred yards away so we stayed put. A short while later Lucas heard a corn stalk break and the mule buck had somehow snuck around us and was 50 yards and closing! Lucas had to get repositioned to ready for a shot while the buck continued towards us. As Lucas went to draw, a bowhunter’s worst nightmare happened; I saw his arrow come off the string. I think Lucas remained much calmer than me and he hurriedly got his arrow nocked again. As soon as he did I was telling him to draw because the buck was on top of us. As Lucas hit his anchor point the buck stopped 20 yards away. It didn’t need to be said, but the big brother in me was coaching, and I said kill him there. Lucas took his time and sunk the arrow perfectly in the buck’s vitals! He exploded at impact and made it several hundred yards before falling out of sight! There were a lot of high fives and hugs after seeing that buck go down. We couldn’t believe it! Lucas drove close to four hours and we had only been hunting for a little over an hour and he was done. It couldn’t have played out better and the Heads Up Decoy worked flawlessly, pulling that buck from hundreds of yards away right into our laps! We were all smiles as we headed back to the pickup to get the camera and necessities to take care of Lucas’ deer. While we stood there recounting the events that had just transpired, Lucas looked down the road and saw another good buck headed our direction. The buck stayed on the road long enough for me to size him up and decide that he was definitely a mature buck with great width, but crossed into the field we had just vacated before I could really assess his antlers. I quickly decided we needed to get a closer look so we ditched the cameras and tripod and I grabbed my bow and Lucas grabbed the decoy. We headed towards the buck, but rather than coming towards us he headed out to the middle of the field to where Lucas’ buck had come from and where the whitetail buck was still located. We could watch the buck the whole way and could tell that he was rutting hard. Déjà vu was happening because the buck went right towards the whitetail and he bristled up once again, but this time the mulie went around the whitetail and headed in our direction staying in plain view. As he closed the distance it was evident he wasn’t coming right at us, but would cross by us several hundred yards away. The mulie walked with his head to the ground and rarely lifted it. Lucas thought we should try to close the gap, but we would be leaving the taller corn and going into an area of knee high grass where the corn failed to grow. I agreed and we moved forward. The buck raised his head once and glanced our way, but quickly put his nose back to the ground and continued walking on the back side of the terrace. I have watched bucks act this way in the past and knew we could be very aggressive. Lucas held the HUD in front of us as we hunched over in “I” formation and quickly closed the distance. The buck was still oblivious when we came to a halt within shooting range. Dropping to our knees, I hastily nocked an arrow to prepare for a shot. Like it was scripted, the buck turned and decided he was going to come check us out. When the arrow clicked on the string Lucas was ranging and the buck was 25 yards and closing. I decided to let him get tight before drawing in case he spooked. Amazingly, he didn’t even flinch. I hit full draw and the buck stopped less than 15 yards away and the VPA tipped Goldtip zipped through him so fast he didn’t even know what happened. He bounded a few yards and would have tipped over, but I couldn’t contain my excitement and foolishly stood up with my arms in the air. The buck finally realized what we were, and tried to flee, crashing 40 short yards later! Unbelievable! We had just used the Heads Up Decoy to double up on two mature mule deer bucks! After coming down from that adrenaline rush we realized that the deer were shot and died less than 100 yards apart. What a hunt! I still can’t believe how it all played out and in such a short time. The hunt unfolded like we all dream they will and I was very proud to be with Lucas when he arrowed his first mule deer. Sharing a hunt like this with my brother is one of the greatest moments of my bowhunting career, and something we will relive together for the rest of our lives. It really doesn’t get much better! Like brothers do, we argued over whose deer was the biggest, but not in the fashion one would think. Lucas thought mine was bigger and I thought his was bigger. We decided to have my friend who is an official scorer for the Pope and Young Club green score our deer. The bucks do not resemble each other at all, but ironically score very similar. My deer gross scored 171 7/8” and netted 156 4/8” and Lucas’ buck gross scored 168 2/8” and netted 157 1/8”, so I guess you could say we were both right. After the mandatory 60 day drying period we will have our deer officially scored and proudly enter them into the Pope and Young record book. Lucas and I will have many more hunts together in our lifetime, but killing two Pope and Young qualifiers in less than 30 minutes in the same field will likely never happen again, and is something I will cherish forever.